Fried red tomatoes: why didn't I try this sooner? Living in the south, of course I LOVE fried green tomatoes. If a restaurant has them on the menu, there is a 95% chance that I'll order them. These are similar, but have the incredible taste of juicy red tomatoes! This was seriously so easy. I made them for family & friends on Sunday and they quickly disappeared! 6. Remove tomatoes from skillet and allow for some cooling before enjoying! Have you ever had fried green or red tomatoes? Those look so good. I've had green tomatoes but never the red ones. I'll have to try it out. Great recipe doll saving it in my chef tap app. I love southern food. Thank you for sharing. I love fried green tomatoes! So I have to try the red ones. Looks good Vett! hmmm... i've never had fried tomatoes before. i have all of the ingredients so i think i'll give it a try. yours look delish! My sister made it last thanksgiving. So delicious! What are your favourite herbs to use? 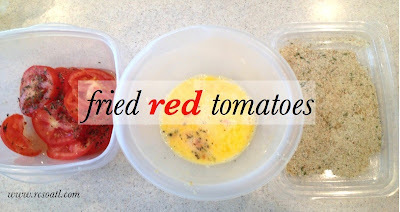 Fried tomatoes in general are awesome, but you need some ranch dipping sauce, too!